Diane Abbott: what’s race got to do with it? NB Sent by phone. I will add links later. The nowtrage over Diane Abbott’s twitter comment that “White people love playing ‘divide & rule'” has been entirely predictable and lamentable, with people on both sides guilty of exaggerating their positions to the point of absurdity. I’m not remotely offended by Abbott’s comment; it is simply too absurd a generalisation to take seriously. I find the rush by people to exclaim offence and outrage at the comments frankly embarrassing; especially since, as a rule, they have been quite transparently politically motivated. It is simply too soon after the sentencing of Norris and Dobson to play that game. Equally however, Abbott’s initial defence that the comment had been taken out of context was weak, because there is simply no context in which bringing race into the point she was trying to make could be acceptable. Many of her defenders have leapt on this, claiming that divide and rule was a feature of white colonialism, but the simple fact is that most white people were not colonialists. Irish potato farmers were not responsible for the oppression of Africa and India any more than Mancunian clothmakers or Italian winemakers. African monarchs who sold their own people into slavery were. There isn’t much evidence to support claims that ‘white’ empires such as the British and Romans were any more oppressive than the Persians or Mongolians. To cut to the chase, surely racialising what is, in essence, a matter of the functions of the political-economy throughout history, is far more of an act of ‘divide and rule’ than, to return to the original discussion, questioning the legitimacy of so-called black community leaders? Diane Abbott’s comments were in response to Bim Adewunmi raising concerns about talk of a single ‘black community’ and the people who purport to lead them. Abbott’s point was that ethnic minority groups who are more united than blacks tend to do better. This is a valid observation, but so too were Adewunmi’s objections to having people speak for her who are often out of touch. And while Abbott is also correct to suggest that ‘divide and rule’ is one of the oldest tricks in the book, so is the co-option by leaders, of whatever race or background, of the groups they claim to represent. That’s true of colonial powers, and it is true of people who enjoy the trappings associated with being a ‘community leader’ in a local authority, as anyone who has ever been involved in local politics must surely have observed. And it is true of party leaders working against their parties interests and of trade union leaders making power plays which ultimately work against the workers but which consolidate their own control and influence. In short, strip race out of it, and there is a very important debate to be had about the nature of power, control and democracy. It suits politicians like Diane Abbott for that debate to be sidetracked by red herrings such as skin colour just as much as her loudest detractors. 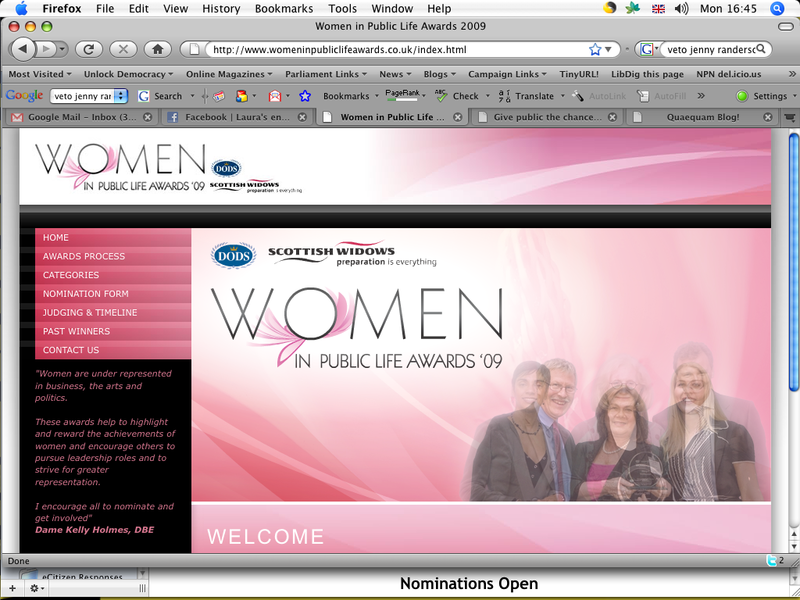 Well done to Scottish Widows and Dods for coming up with what is possibly the most ridiculously patronising design for a website aimed at women in public life I’ve ever come across (and as one of the organisers of the Campaign for Gender Balance Awards last year I speak from experience). It isn’t just the sheer pinkness of it all, it’s the flower design and the sheer flowiness of it all. As one of my colleagues suggested, it looks like a tampon advert or possibly some kind of pregnancy test. Fundamentally, doesn’t it all come across as rather weak? Is that the message they want to convey about women in public life? Frankly, I’m surprised they didn’t call it Women In Management and Public Life (WIMPL) and be done with it. Oy, what a hectic few weeks I’ve been having. As such, I’ve only just got around to reading Lynne Featherstone’s thoughtful article on Lib Dem blogging and Andy Mayer’s excellent response. Is the Lib Dem blogosphere too inward looking? Frankly, yes it is and I’m well aware of being a guilty culprit. Jennie Rigg is absolutely correct, at least in my case, to say that too many Lib Dem bloggers use LibDemBlogs as their blog roll. The best I can do by way of a defence is point out that at least we aren’t as bad as the Labour blogosphere, but that isn’t saying very much at all. Why is this? When I started blogging back in 2003 (ah, Blogger! How I miss thee. Not. ), it wasn’t like that at all. In scenes rather reminiscent to the “Dawn of Man” sequence at the start of 2001: A Space Odyssey, Lib Dem bloggers would mount dawn raids upon Tory bloggers, Tories would do the same to Labour bloggers, and vice versa. Sometimes we’d even get into conversations with normal people as well. Hubs – or to labour my 2001 analogy still further should I say monoliths? – like LibDemBlogs and ConservativeHome seem to have made us all more insular. Even the Tories lack their crusaders. Iain Dale, Tory blogger par excellence is a commentator not a campaigner. In this respect, and thankfully in so many other ways, Laurence Boyce is mistaken. Staying on LibDemVoice and firing salvos from there is an exercise in futility – it will ultimately only attract the interest of fellow members and other political obsessives. I read an article a few years ago talking about the 2004 presidential election, I forget where, which summarised the Democrats’ failure and the Republican’s success as lying in the fact that the Democrats tended to organise in hives (as in bees) like the Daily Kos while the Republicans run in packs (as in wolves). It’s an evocative image that has stayed with me – I even nicked it for an article I wrote a couple of years ago. Talking to Jerome Armstrong a few weeks ago (namecheck, namecheck…) he agreed that was a problem for the Democrats, albeit one which is rectifying itself now. We need to do a bit of dismantling ourselves I feel. The party’s campaign-themed blogs like Corruption is a Crime, Home Office Watch and Forces Focus are a step in the right direction but as they are written by already busy MPs and their staff they tend to get updated sporadically and tend to be very on message. Neither of these factors do much to invite return traffic or even search engine traffic. What we need is the next step on from that – independent blogs maintained by individuals with a passion for the subject, with occasional contributions from the centre to help it along. I have to admit my own attempt at doing this a couple of years ago, a blog focusing on intergenerational equity (remember Hands Off Our Future? no? I’m not surprised really), ended up a crashing failure simply because I didn’t have the time to dedicate to it. Yet I’m convinced that a blog on this theme would serve a valuable purpose, both in promoting the issue and helping the party to reach out to people who wouldn’t normally come anywhere near a Lib Dem blog. A quick glance at sites such as HousePriceCrash suggests that there are lots of people out there who feel very strongly about the issue – if only I had managed to maintain my blog given the developments of the last nine months. It is niches like this that the party ought to be actively seeking out. Finding the activists who are willing to then take a lead on the topic is another story however. As the last few weeks have demonstrated, work pressures often force me underground at the very point at which political campaigning is most needed. During election periods I have to be relatively diplomatic (I said relatively) at a period when I’m sure the party would quite like me to go into rottweiller mode. I’m sure others face the same dilemma. Fundamentally, the only way to square this circle is for putative campaigner-bloggers to have some degree of self-sufficiency and be in a position where they can afford to take risks. Iain Dale’s popularity came about largely because he spent six months after the Tory leadership election in 2005 doing precious little else. Iain had the contacts and was at a point in his life where that was possible (this isn’t a criticism – quite the opposite – and I hope it doesn’t come off that way). But unless someone starts handing out grants to bloggers, it isn’t something we are all going to be in a position to start doing any time soon. Can science find a cure for conservativism? There was an interesting article in New Scientist last week about research suggesting a genetic basis for political opinion (You can’t read the full article? You mean you don’t subscribe? Tsk!). David Frum says that he is “flattered by the evidence that conservatives are more honest and dutiful than liberals”. But given the huge number of variables that affect the outcome of an election, it would be a foolhardy researcher who would draw generalisations from Jost’s work, he says. The AEI supports “limited government, private enterprise, individual liberty and responsibility, vigilant and effective defense and foreign policies, political accountability, and open debate” – that sounds pretty classically liberal to me and about a million miles away from a fruitloop like Mike Huckabee. It certainly doesn’t seem to be the sort of “drawbridge up” conservativism cited in the rest of the article. Overall, it’s a bit of a mess. But it, and another article about autism, got me thinking. It cites one piece of research purporting to have found a link between a gene which regulates serotonin levels in the brain and propensity to vote. What appears to be happening here is that people who can better regulate their brain chemistry tend to be more sociable. In principle therefore, it would be hypothetically possible to come up with a pill that would make people more pro-social, which in turn would probably do a lot to improve election turnout. What, in essence, is the moral difference between such a pill and encouraging pro-social values at school? Since there is clearly a link between diet and behaviour, how is it fundamentally different from Jamie Oliver’s school dinners? If we can justify mass medication for things like tooth decay, can’t we justify this? We already treat depression in such a way (or at least we attempt to). Could we cure other anti-social attitudes as well? Xenophobia? Misogyny? Violence? We’re not talking about major surgery here or anything even vaguely resembling a lobotomy, just the slight changes in the chemical balance in the brain which leads to certain basic instincts behaving differently. Wouldn’t that be better than locking people up or wasting time attempting to reason with people who science informs us cannot be reasoned with? At the same time, we have reviewed and are in the process of reviewing a whole range of things which were at one point viewed as mental disorders and are now coming to conclude are merely personality traits. Homosexuality was regarded as a disease 50 years ago. Increasingly autistics are fighting a battle which at least superficially has many similarities to the gay rights movement. The reason I’m pondering all this is not because I want to create a “cure for conservativism” but because I’m becoming increasingly conscious of the fact that science and our notions about free will are increasingly coming into conflict. On one level that tension does not, and never will be particularly meaningful. Science is unlikely to ever become so adept at understanding our genes, brains, bodies and environment to such an extent that it can predict exactly what anyone is likely to do at any given moment. But on another level, it is likely to throw up all sorts of inconvenient truths such as levels of intelligence and modes of behaviour which have fundamentally chemical bases and can thus be altered in a similar way. We’ve created distinctions between “disorders” and personality traits which are looking increasingly unsustainable. Surely there needs to be some kind of distinction between a negative thing that we should seek to cure or otherwise discourage, and a neutral thing that we should tolerate in a pluralistic society? But that line seems to be becoming increasingly blurred and just as we are having to seriously consider reclassifying some things from the former to the latter, so we may have to consider others going the other way. Or is it to be anything goes? I wonder to what extent we are ready for this debate. There is a real reason why we need to be. If we aren’t, the interests of pharmaceutical companies are likely to dominate it, at least in the short term. Or is this all merely paranoid delusional fantasy? It’s all there: the short sentences, the lame gags about individual’s physical characteristics, the “dear reader” asides. Is this what passes for a genre? If I’m honest, I don’t even know if it stems from Hoggart himself originally – it’s just that I read his sketches more than anyone else’s. Certainly Simon Carrs are different. But then, Simon Carrs’ are rarely funny. Or about anything other than Simon Carr. We should be asking this question: does the smug, self-satisfied political sketch still have a place in modern political discourse, or should it go the same way as those rude poems you read in old issues of punch?